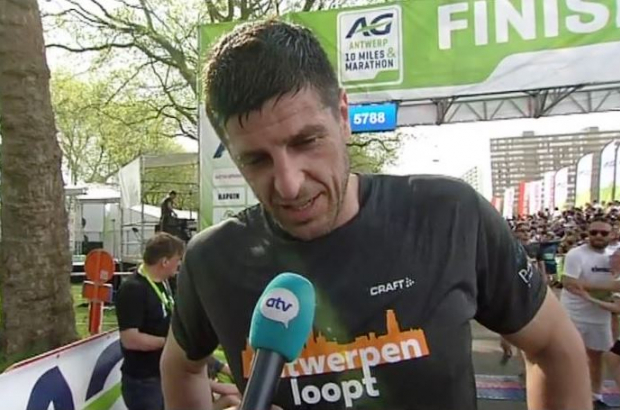 Sebastien Bellin, who lost part of his left leg at Brussels Airport during the bombing in 2016, completed the Antwerp 10 Miles race yesterday, with much media attention and not a little emotion. Bellin was born to Belgian parents in Brazil, moving to the US as an adolescent. He played college basketball and eventually turned pro, playing in Brazil and eventually for Belgium’s national team. He retired from the sport in 2010 and moved back to the US. He is now a partner in a sports streaming start-up, which requires much air travel. He was in Brussels Airport on 22 March 2016, heading back to the US after a business trip to Belgium. Bellin than had to stay in Belgium for three months following the bombing, undergoing six surgeries to his leg and right hip. Five additional surgeries would follow in the US. Bellin will be spending a lot more time in Belgium: He was appointed general manger of Charleroi’s bastketball team earlier this year. The Antwerp 10 Miles & Marathon includes a 42-kilometre marathon, the 16-kilometre 10 Mile, a short run and a kids’ run. As it turned out, finishing the longer races was difficult, even for those not recovering from such an injury. More than 40,000 people took part in one of the races. With temperatures reaching 26°C, more than 40 runners required medical assistance. As of this morning, 19 were still in hospital.